Memorials | Brush off the dust! History now! Beautiful day in Washington, DC, today! A little blustery–most of the cherry blossoms have blown off and collected in petal clusters along the paths–but the sun kept us all warm and the climate was otherwise quite accommodating. A great day to use historical examples to talk about civics and government! Different backgrounds, different states, evaluating the "depressing facts" of the Great Depression and the government's responses. We hit the Jefferson, FDR, and MLK memorials, today. We discussed the merits and demerits of small and big government. Then we discussed the role of the citizen–naturally, not restricted to government of one size or another. Particularly, we discussed the methods of King in response to injustices entrenched in government policy, comparing and contrasting those with others, such as Malcolm X. 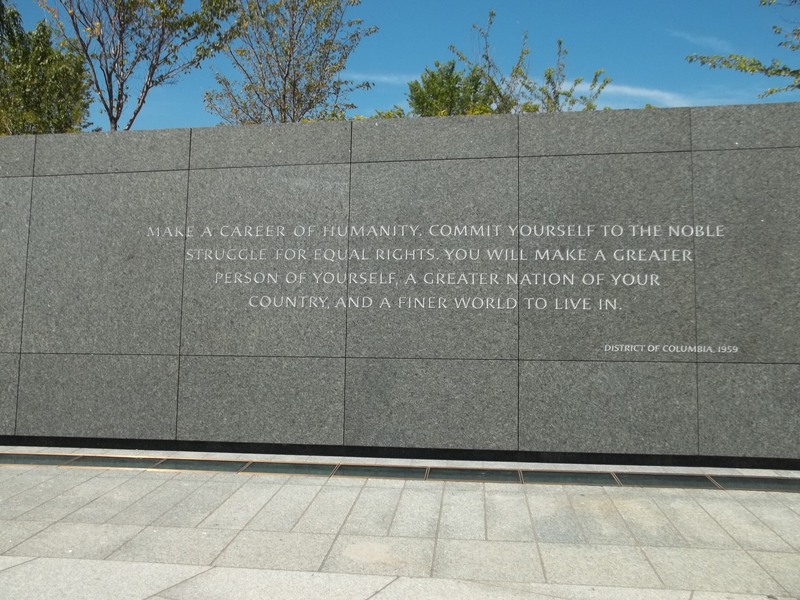 Entering the MLK Memorial and his quotes, evaluating citizen-responses to government injustice. After we hit these memorials, our bus had lunch at the National History Museum. Students had time to eat and explore before checking out the Hall of Evolution and how the concept is portrayed by public institutions–in other words, should it acknowledge debates–while drawing some parallels with public museums and public education. Close Up participants get to be students and tourists while on program. We finished up our Smithsonian visit and headed up to the Carnegie Institute for a seminar with Politico’s Senior White House Writer, who talked with students about media, driven by their questions. Subjects covered the viral news stories, finding reliable reporting, following politics in today’s media world versus the pre-internet world, his belief in investigative journalism which he feels is on the decline, and the merits of major news outlets that are clear about the side of the aisle they stand on. A useful seminar to follow the earlier issues raised in active citizenship as information is key to citizen response. My workshop had another engagement covering federalism and the criteria students have for whether national or state governments should be in charge of specific responsibilities. Then I was off for the evening, but I am looking forward to hearing about the domestic issues debate between DC insiders Barry Piatt (liberal) and Ken Insley (conservative), debating the issues the students introduced, tomorrow morning! In my last post I raised some of the challenges that present themselves to the public in the case of memorials and monuments and with public memory in general. These were meant for every citizen approaching any memorial. 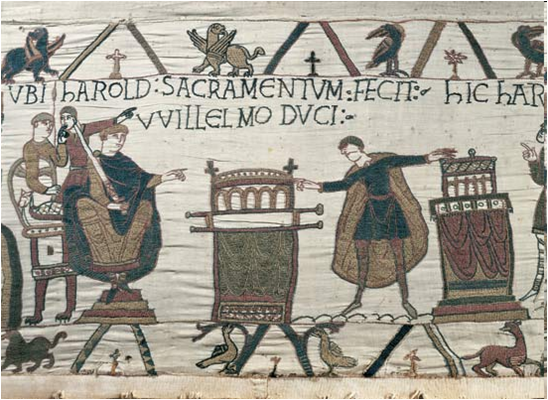 In this post, I am specifically writing about how we can make use of these in education. As is often the case, the challenges here are the opportunities, as well. The first thing is to remember, that memorials and monuments reflect at least two points in time: the historical event (or life) and the creation of the memorial/monument. Both must be accounted for in making a successful historical visit. (Note the important difference between memorials and landmarks! The Alamo may stand today as a memorial for many things, but it is the same edifice that stood during the battle—it is not an artifice constructed in memoriam.) When visiting a memorial with students, they should be given the tools to engage with the memorial in the most productive way. In other words, we want to fuel students’ reflections on people or events, as opposed to blindly accepting the portion of the story or legacy that the memorial presents; we want to encourage thoughtful and informed criticism, not senseless iconoclasm; we want students to engage the artist/designer in dialogue regarding the legacy of the memorialized person or event; we want the students to exercise the tools of history and try to honestly understand the person or event and the contemporary era. Walking into a monument can be like walking into a small party of closely-knit friends, sometimes it is hard to engage it; the symbolism is wrought into the design so plainly, it is like trying to follow a conversation laced with inside-jokes and private innuendos all the while being left out of the laughter. There are two reasons the symbolism seems illusive to students: inexperience with cultural tropes and a lack of understanding surrounding the event. There is a third reason applied to a larger audience than students, namely the development of esoteric conceptions of the artist or designer which require explanation from the artist or interpretive guide—these are rarely self-explanatory even if one is an adept in tropes or well-versed in the relevant history. 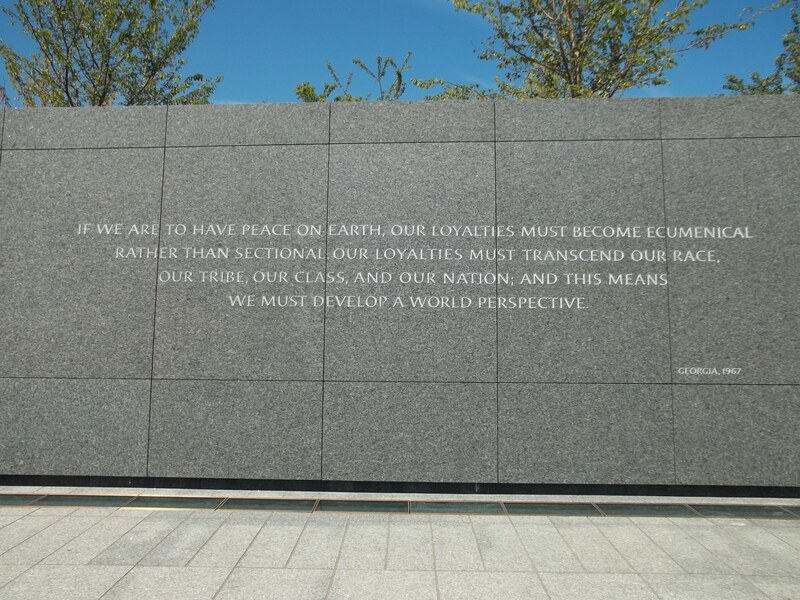 (For example, at the new MLK Memorial, the Mountains of Despair and the Stone of Hope are far from obvious without explanation being provided.) 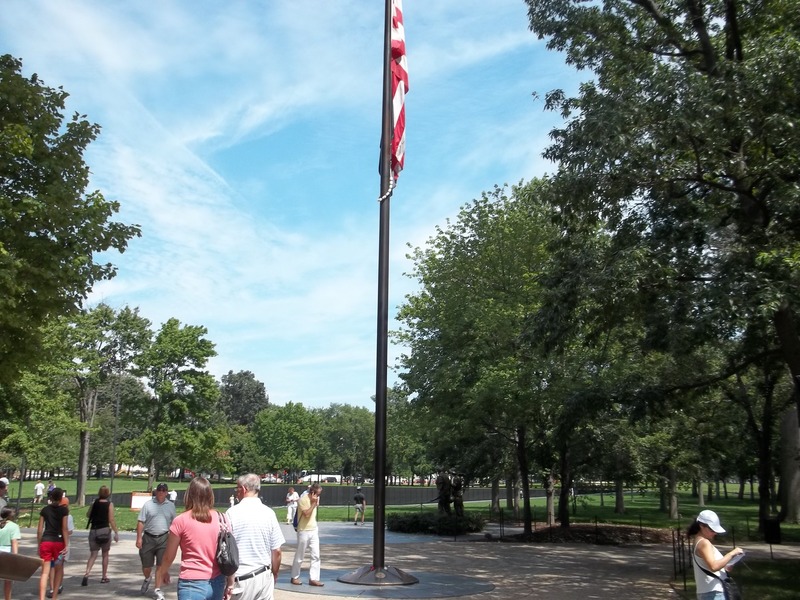 Most memorials have attendant materials, websites or guides to explain their design. These should be explored after the necessary prep work, but before or in conjunction with the memorial visit. Perhaps it is not surprising that many memorials and monuments go up in honor of controversial people/events or those with controversial elements. If one considers the National Mall alone, there are numerous examples. By tasking the students with learning a debate and then engaging it, one creates circumstances for which the memorials and monuments are made more interesting. For example, before visiting the Lincoln Memorial students can engage in debates about whether or not Lincoln’s actions in the Civil War eroded states’ rights, whether he was justified in suspending habeas corpus, or whether he was prejudiced himself (and, if so, did he evolve)—all questions that have been raised in our national memory of the man during the event. Each remembered person or event has its own historical nuances embedded within its consciousness. To see whether or not a memorial engages these nuances once a student has delved into the debate himself is rewarding on several levels. The other side of the memorial coin is the time in which it is built. The Lincoln Memorial is not dedicated until 1922. By this time, the age of segregation has been reinforced in the highest court of the land and the last of the Civil War vets have passed away. 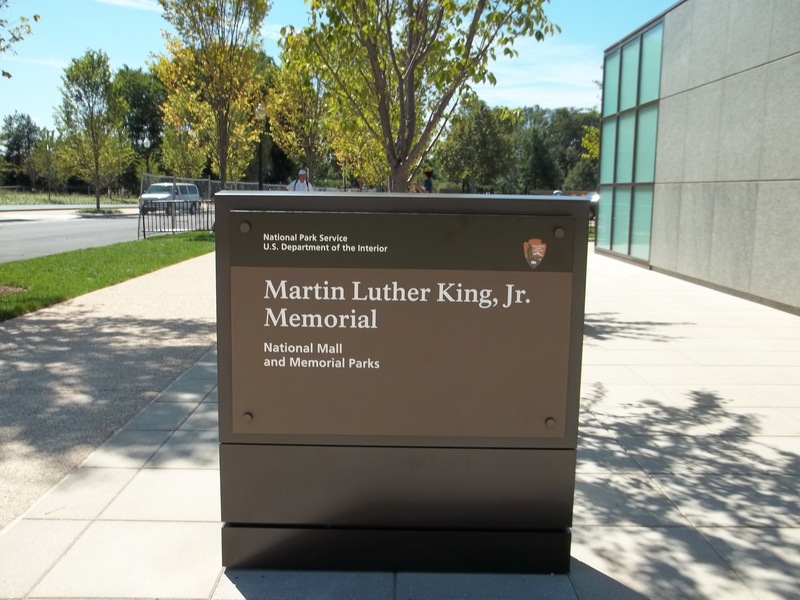 This memorial is unique among most of the others on the Mall, of course, because it would serve as a stage in future Civil Rights efforts and many other causes. The adoption or absorption of the Lincoln legacy into the causes of other groups is an interesting phenomenon in and of itself. It is probably worth noting that elsewhere, around the same time as the Lincoln memorial commission and dedication, other cities were building memorials to Confederate and Union officers. At the dedication, the crowd was in segregated seating. One of the reasons I suggest debates, is because of the staying power researching and supporting an argument has with students. It demands reading, listening, writing and the gathering of evidence for the purpose of formulating the argument. On the one hand, these are essential skills for everyone to possess; on the other hand, the process and information is lasting. If students further engage each other’s arguments through assigned reading of each other’s papers during draft phases, the debate becomes more powerful, still, and ferments in their minds allowing them to bring really informed outlooks to the memorial. This works whether you are considering legitimate scholarly debates about subjects or cultural legacy debates between regions, citizens and historians, etc. 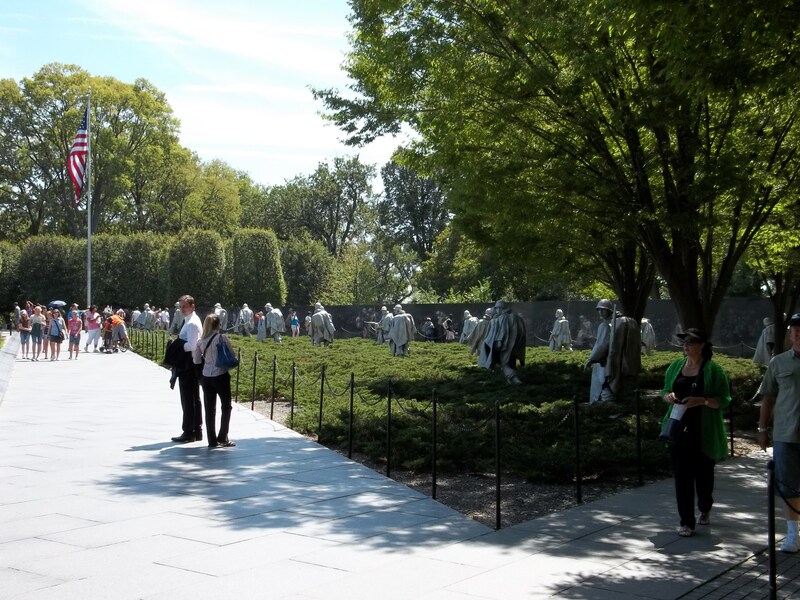 Once at a memorial, there are a number of approaches that can be taken: 1) design a small survey for other visitors considering elements of the memorial, legacy of the event, knowledge that people bring to the memorial, etc. ; 2) critique the memorial’s intent with its application: “does it successfully…?” “do these elements call to mind…?” etc. ; 3) ask students to analyze what the memorial remembers versus what it omits and further ask if this is just; 4) ask students if they think the memorial prompts further reflection or research; 5) ask students what a foreign visitor or someone from another region of the country (as applicable in some local monuments) would take away from visiting and exploring the memorial/monument—does this suggest success or failure for the memorial? These are just a few of the options at one’s disposal, but the salient feature in all of these is to really reflect on how we are asked to remember, while considering what historical investigation suggests about the past figure or event. If we accept that there is a certain subversive element in every memorial or monument—a design intended to direct your memory of X—than we can make an honest assessment of it. Students will likely approach memorials the same way they do museums and history books: as authorities on the subject. This is a passive acceptance of what is presented to them. We do students a disservice if we allow them to accept without questioning and a greater disservice if we tell them to question without demonstrating to them the tools that allow them to ask informed questions. 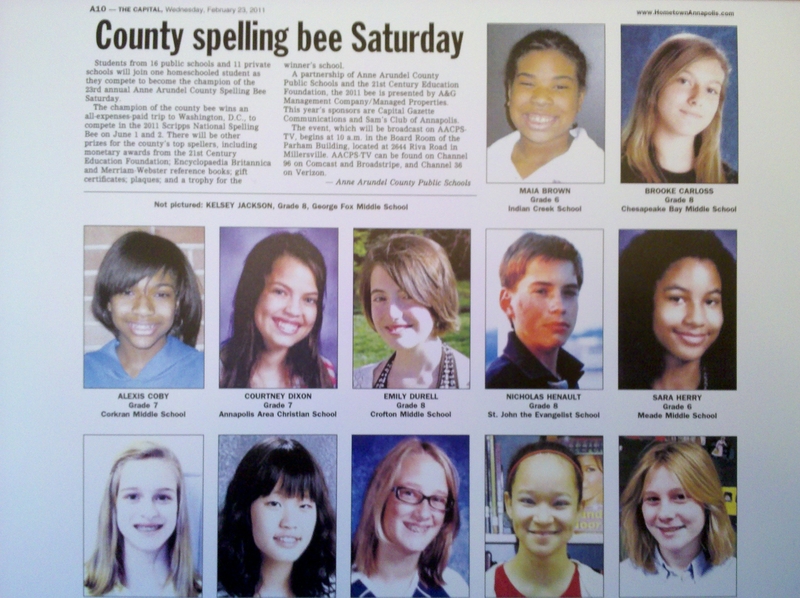 Without those skills and lessons, we have really failed them. We condemn them to either follow the herd like sheep or wander our city streets aimlessly seeking “change” without knowing what change they want or how to accomplish it. Memorials, even more than poorly written textbooks or news reports, offer an excellent opportunity not only to teach about an event or person, but to teach about someone’s attempt to direct their one’s thinking. The Korean War Memorial is in memory of the "forgotten war"
I am not arguing that memorials or monuments are thus bad things, necessarily, but take a look at Soviet monuments in Moscow or the Kim family in North Korea and one can see how it is that an attempt to “direct” thought regarding legacies can certainly be dangerous. Naturally, American monuments are not the products of dictators—they are frequently the result of democratic processes, in fact. As such I except the differences. I do not think FDR memorial is akin to Stalinist programming and design, but I do stumble on his supposed legacy the most when I think of all the damaging things that are omitted from his memorial—his “Redlining” legacy is one of the major contributing effects to the decline of minority neighborhoods in our urban areas, for example, and about a mile or so away from his memorial is another dedicated to the American citizens of Japanese descent who were deprived of their rights by his executive order. I think David Rieff’s article, “After 9/11: The limits of remembrance,” is an important acknowledgement of the challenges of memorial. His statement that “the ghost at the banquet of all public commemoration is always politics,” is an apt one for a country that has always been run by two parties (for the most part) and their dissidents. He is quick to acknowledge the need for mourning, but also asks when it is that we forgive and forget, and further queries whether or not remembrances inhibit our ability to do that. It is fair to argue that memorials and monuments may be free of “too much truth” in the same way that Rieff suggests eulogies are free of such, but that cannot be the end of it. Just because we omit it from the eulogy does not mean we should obliterate it from our knowledge or overlook it in our investigations. This is the trick with public memory. This is the challenge and the opportunity in teaching with memorials and monuments. It is necessarily different than the museum exhibit which generally, though not always or not always successfully, seeks to be more conscientious in its consideration of history. Frequently, museum exhibits ask challenging questions, while attempting to provide the materials for thoughtful consideration on the issues at hand. In lieu of those aids, teachers must provide the materials and present the initial questions that stimulate research and thought along these lines in the case of memorials and monuments. The Program for this week. 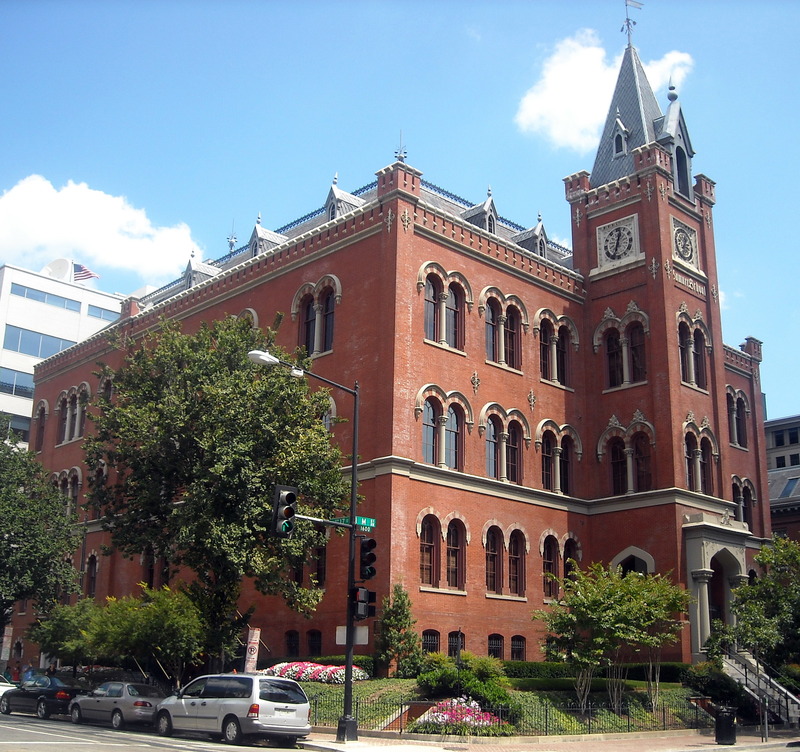 In honor of and inspired by the 37th Washington Historical Studies Conference held this past weekend in Washington DC at the Charles Sumner School Museum and Archives, this week is devoted to the investigation of the city from the perspective of places and spaces. This taps into an old love of mine–Washington DC history–and takes me back to my first career path out of college as a tour guide for Bike the Sites and a Program Instructor for the Close Up Foundation. For the first few years after graduating from The Catholic University of America, Washington DC was my classroom, my stage and my playground. The conference this past weekend was in all honesty indulgent! Sadly, my teaching schedule and my family engagements prevented me from attending the entire conference, but I really enjoyed what I was able to attend. It was great to discuss both the academic and methodology questions with professional historians. What follows in this post is an introduction to the overarching theme I am following this week in a series of posts dedicated to Washington DC, its places and spaces. 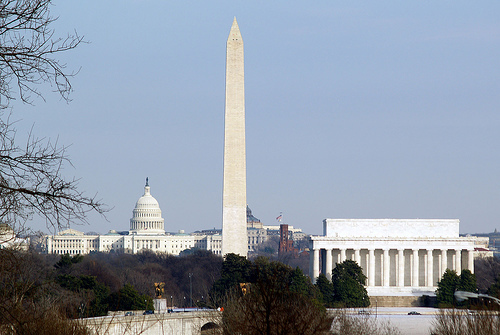 DC is not like most other cities in the United States, nor other capitals in the Western World from which it was born. The many unique circumstances and situations were both intended and accidental. It is essential when discussing the history of the city to understand its at times conflicting roles which create challenging concepts of space in this city and capital. The Place . . .
First and foremost in the minds of most Americans is the fact that Washington DC is the capital of the country. As such it is the primary workplace and hub for the federal government. For many people, the concept of the city begins and ends with this idea. Like other big cities, people are drawn to it for career reasons that often revolve around our federal workings and mechanizations. I know many people who have worked in the city for multiple decades but have no other connection to it. When people use the expression “inside the Beltway”, they often refer narrowly to the offices from which the federal government is run, highly misleading if one were to look at a map and conceive of the space that actually sits “inside the Beltway”. The “Beltway” is the 495 loop which encloses not only the District of Columbia but parts of northern Virginia and counties of southern Maryland–multiple jurisdictions, in fact! 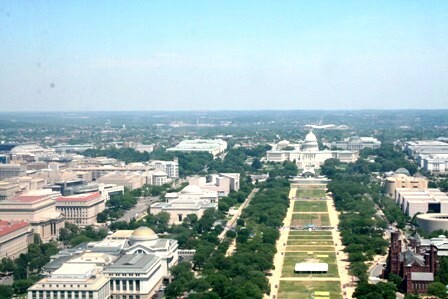 Where Federal employees go to work: the National Mall and Federal Triangle. Secondly, people in this country think of the great marble edifices that dot the Washington landscape. 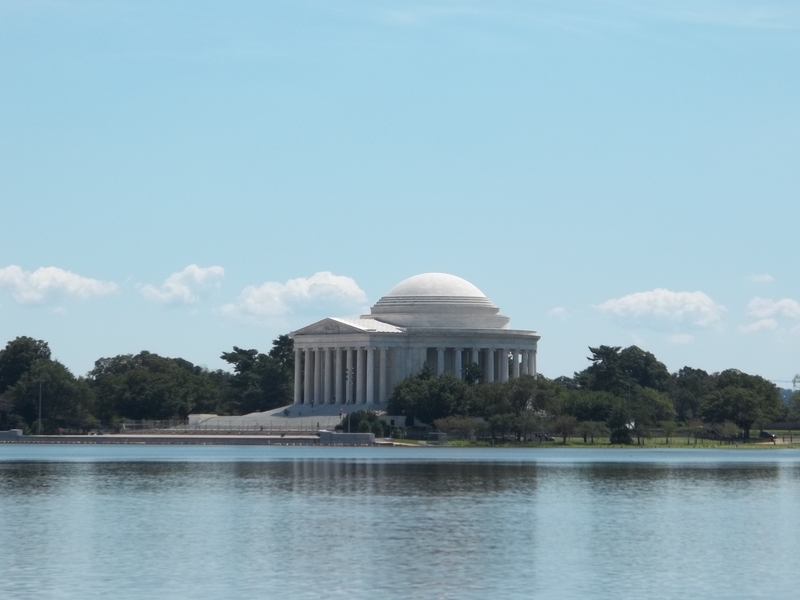 While this includes sites such as the White House and the Capital, they are seen not so much as office buildings, but as monumental shrines along with the Jefferson Memorial and the Lincoln Memorial. 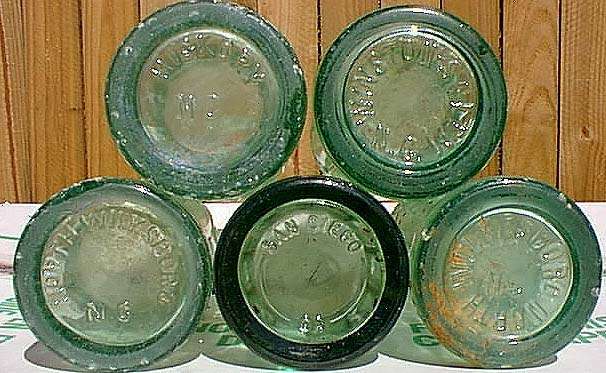 These are symbols to be visited, photographed and cataloged in the family records (often on hot and humid summer days or in eighth grade school groups!) and are part of the DC civic pilgrimage that often further includes the Smithsonian Museums or the National Gallery of Art. What’s more these are all free of charge (unless you pay for a transportation or guide service), making them further highly desirable because they make for a cheaper vacation in many respects than other family vacations as families can stay further out and use Metro to get into the city. This is the “visited DC” as opposed to the one people come to for a job or even a mission–although, there is certainly room for overlap! Some of the marble shrines of Washington DC: the Capitol, the Washington Monument and the Lincoln Memorial. U St. 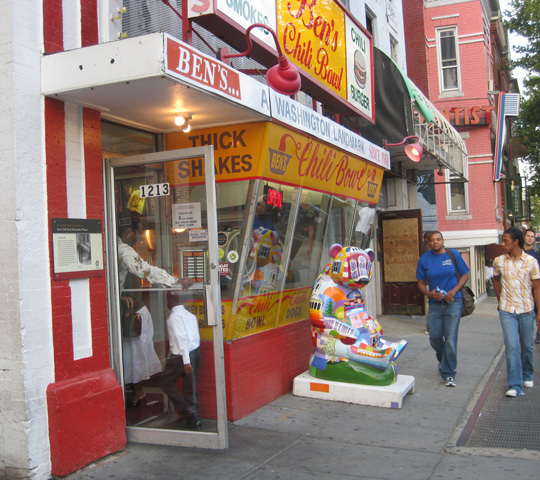 Neighborhood in DC and Ben's Chili Bowl--best half-smokes anywhere!
. . . And, thus, the Spaces. So, this small plot of land, under 70 square miles, is geographically a cacophony of uses, experiences and jurisdictions–you wouldn’t believe how many police forces exist in that small plot of land–DCPD, FBI, Amtrak Police, National Park Service Police, Capitol Police, etc… There are many claims on this land and people experience this city differently: sometimes because of race or economics, sometimes because of politics or personal quests, sometimes because of greater or lesser understanding about how our country functions. In conclusion, DC is unique. Whether you are talking about mayoral races or greater issues such as segregation, DC has always been a special case. 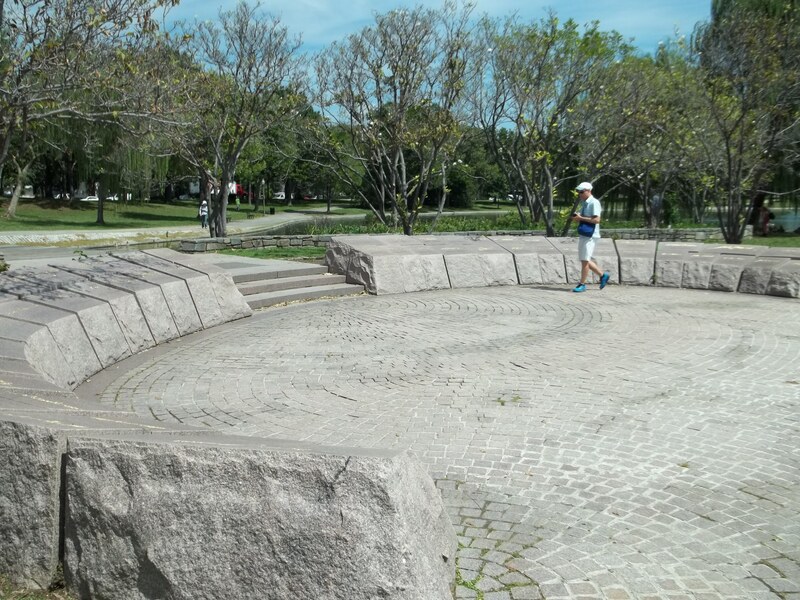 Again, with the inspiration of this past week’s conference presentations, I am going to run a 4-post a series looking at the unique space of the District of Columbia. These will include a look at the city’s inception and the original conception of the Federal City, tomorrow; the locals’ space in the city, Wednesday, versus the locals’ space in the capital, Thursday; and finally, the city as it is a democratic stage and shrine on Friday. 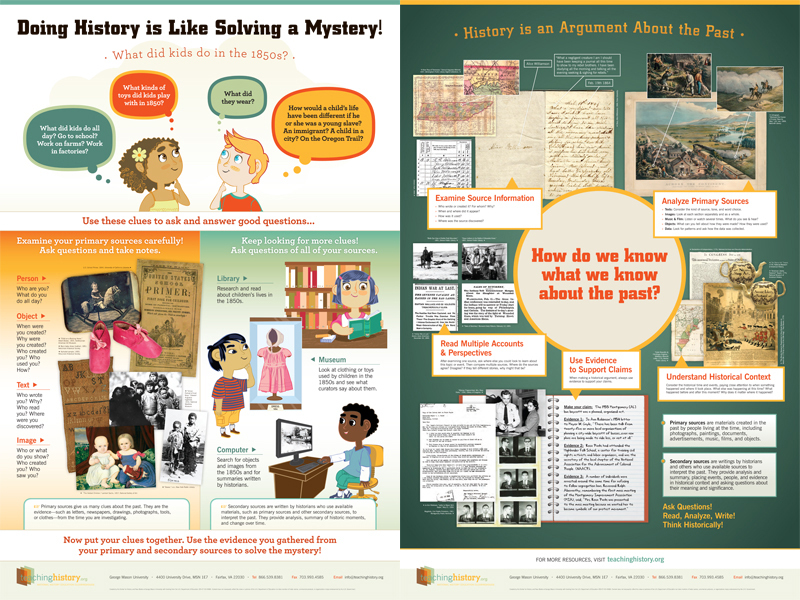 In these posts I will cite some of the historians I listened to this past week. Their ideas along with the many I have cultivated in the course of a handful of years studying and presenting on the city (both for entertainment and education) will be a brief introduction into the complexities that few people outside of the DC metropolitan area regard or consider, presented both with an eye to the past and the present. *Note: There exists a much more sophisticated discussion about spatial relations in sociology and social justice. I am not sufficiently well-versed or well-read to open an extensive discourse along those lines but they feature prominently in debates centered around urban-planning and spatial claims of social justice, in particular, and broader areas considering the lived environment in the U.S., including rural, urban and suburban living. Henri Lefebvre, David Harvey and Edward Soja treat these ideas specifically in their works–the application of which on the case of DC is a particularly intriguing question (one that George Washington University doctoral student, Greg Borchadt, is researching and presented on in “Democracy’s Stage as Contested Terrain: The Spatial Politics of Washington’s Early Civil Rights Movement, 1939-1954” at this conference).